I miss the convenience of buying a Nature Valley Granola bar, and calling it good for breakfast. Since they’re not safe for me, and since I needed to trial some cane syrup I bought, I went poking around the Interwebs and found this recipe that I modified. 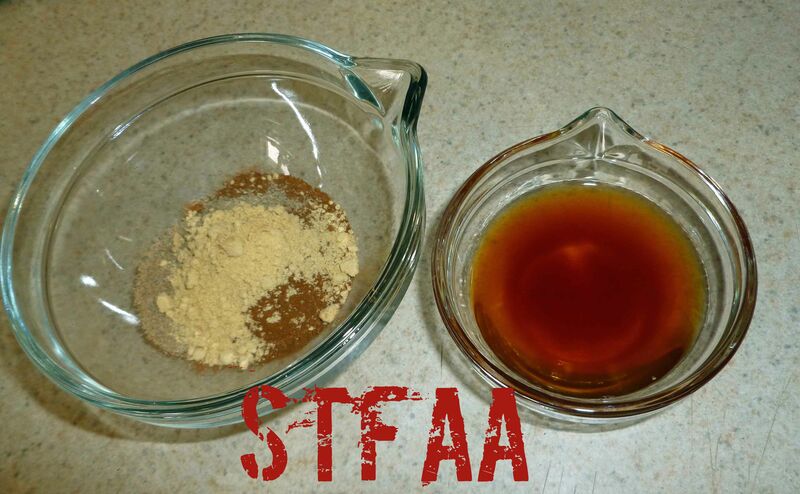 Sadly, the cane syrup was a big fail and caused a reaction. Yes, I know I can make cane syrup and I do. I just don’t want to. I was just hoping to have one damn ingredient component that I don’t have to make before I make the actual recipe. It was a big disappointment, although frankly, I was pretty sure it was going to be a fail as they use corn syrup in the facility where it is made. The original recipe uses honey (I don’t currently have a safe source), but homemade cane syrup will work since the commercial version did, and I’d be willing to try it with my safe molasses. You could also try maple syrup as a substitute, but I’m allergic to maple pollen so I haven’t bothered to trial a maple syrup from a safe source that doesn’t use canola or dairy as a defoamer as it’s boiling down to see if I can manage maple syrup if it’s pure. Anyway, let us know if you try different things and it works. I used cashews in this recipe, because it’s one of my safe nuts, but if you don’t do tree nuts, you could substitute other seeds, such as sunflower or pumpkin, or you could use dried fruit, such as raisins or dried cranberries. To give you another helpful hint, I made my bars way, way too thick. So they were sort of brick-like and broke into small pieces as I was cutting them. Which is good if you want granola cereal but not so much if you want them to be bars and you don’t want to try to gnaw on a brick. Make them thin. Spread them out across that whole cookie sheet. 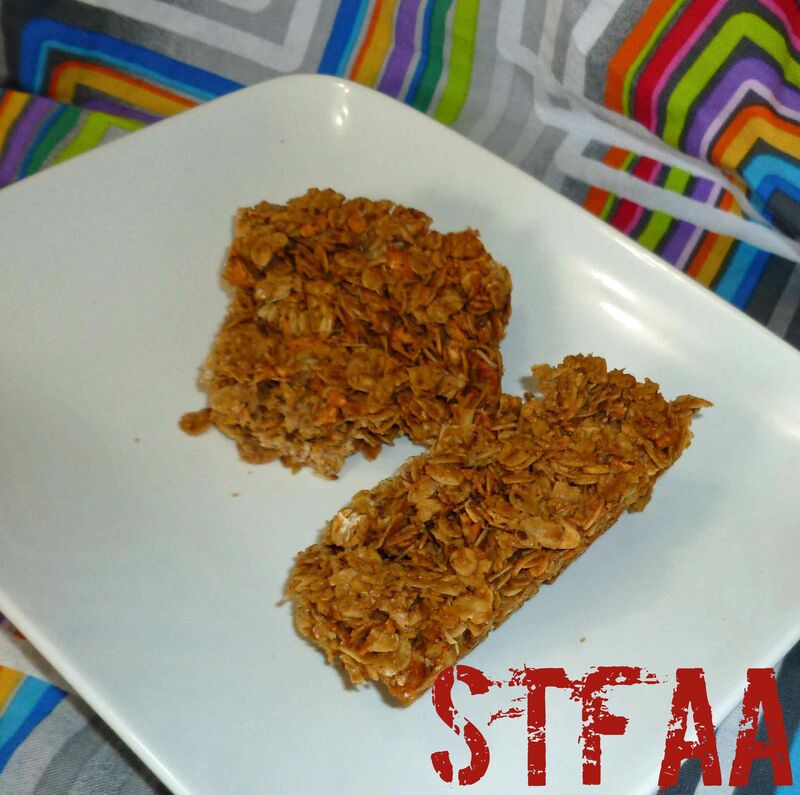 Crunchy granola bars for a quick, easy breakfast or to use as shelf stable snacks while traveling. Place your oven rack in the center of your oven and preheat it to 375°F degrees. Line your half size baking sheet with aluminum foil. 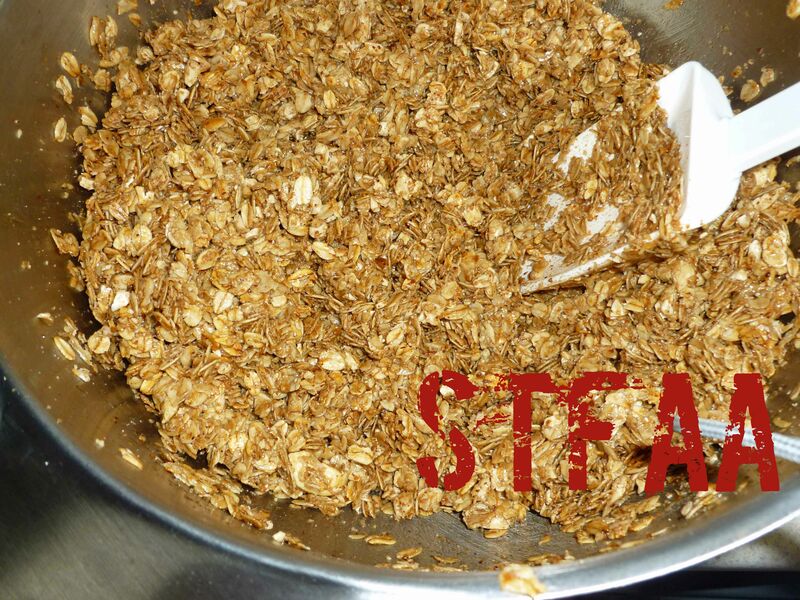 Place oats, oil and sat in a large bowl and mix thoroughly until the oats are coated with the oil. 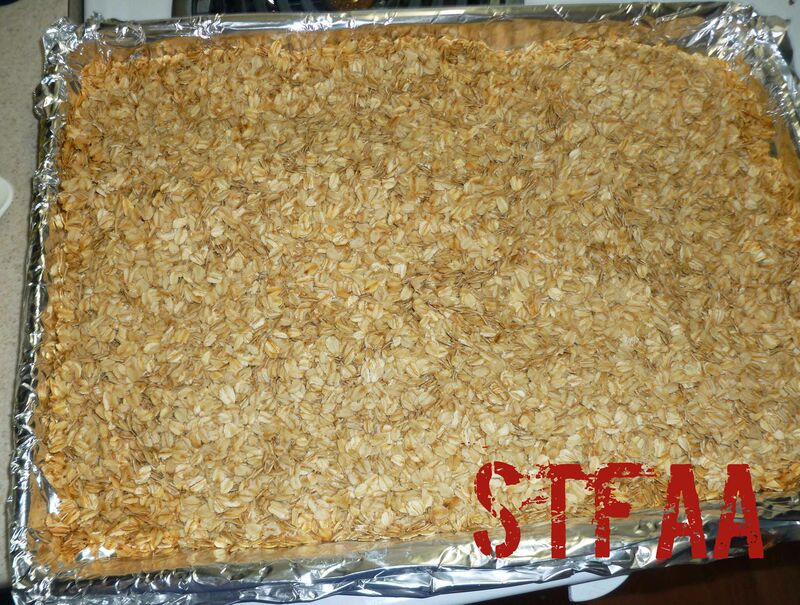 Spread the oats on your baking sheet in an even layer and place in the oven. Stir them every 10 minutes or so until they are pale gold, which took me about 35 minutes in my oven. 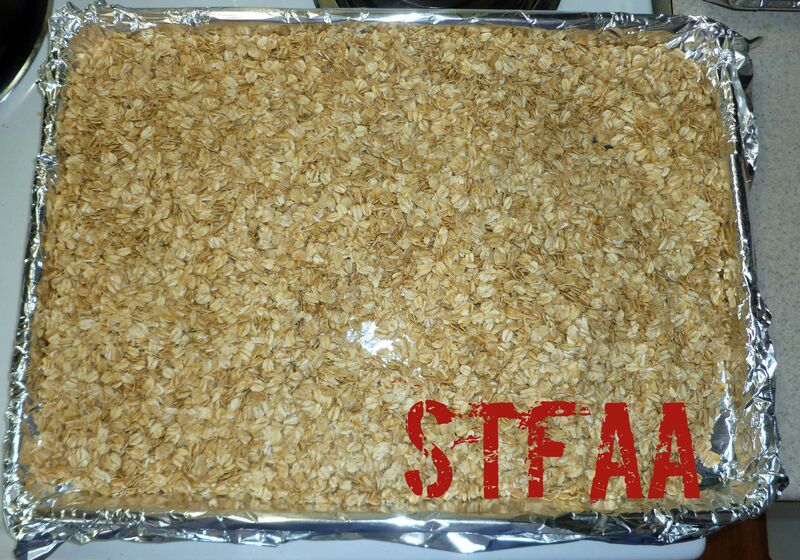 Take the oats out of the oven, and reduce your oven temperature to 300°F degrees. Place the chopped cashews (or other nuts, seeds or dried fruit) and the toasted oats in a large bowl. Keep the foil on the half size baking sheet, you're going to use it later. 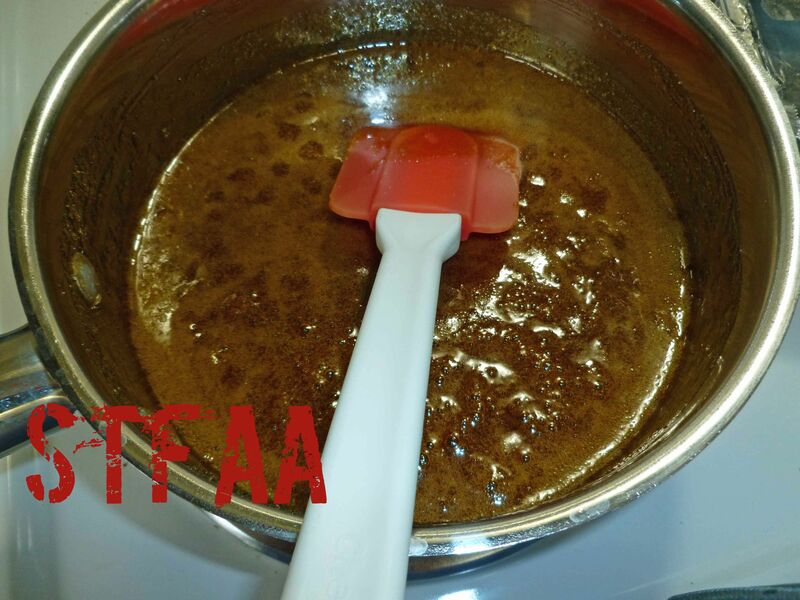 Place the cane syrup (or other substitute) and brown sugar in a small saucepan over medium head, stirring frequently until the sugar is dissolved, about 10 minutes. Remove the syrup and sugar mixture from the heat, and add the vanilla, cinnamon, ginger and cardamom, stirring well. 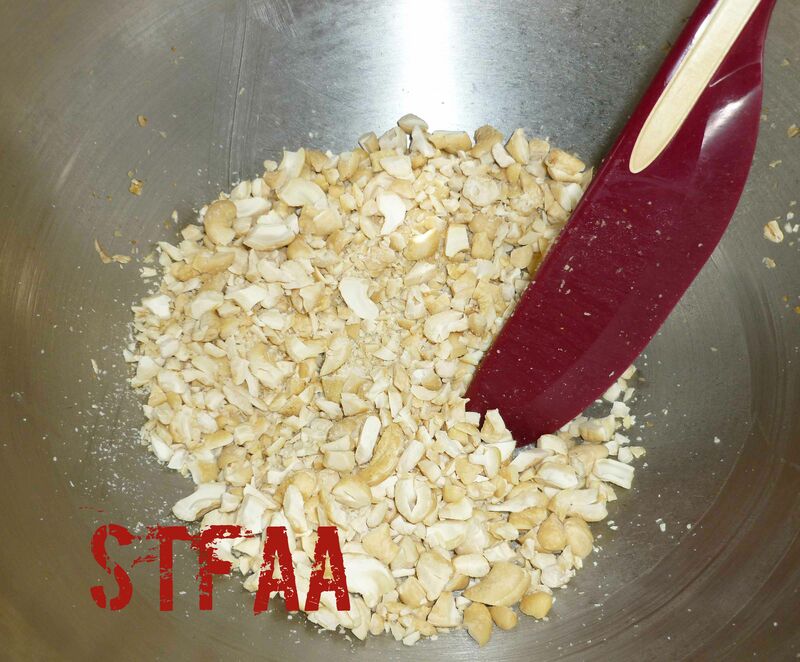 Add the syrup and sugar mixture to the bowl containing the cashews and toasted oats, and stir with a silicone spatula until the oats are completely coated with the syrup and sugar mixture. 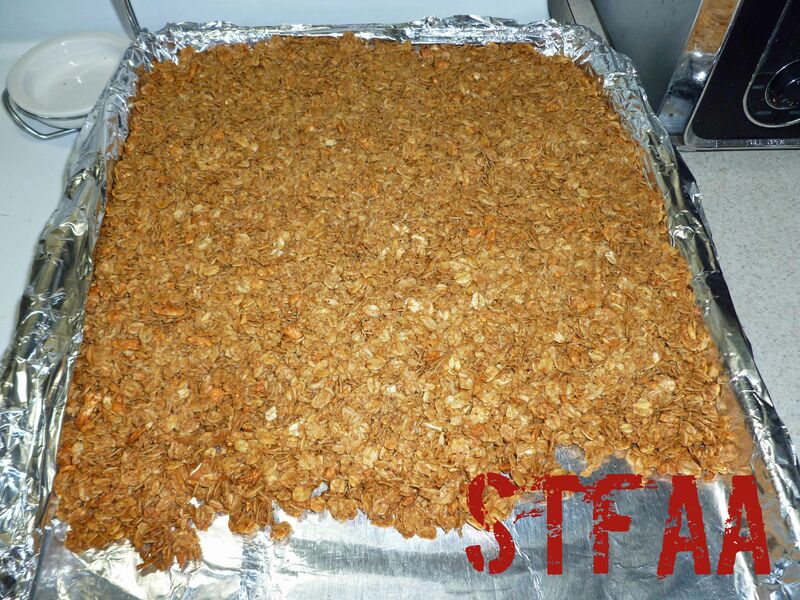 Pour the oat mixture on the baking sheet lined with foil, spreading it out into a thin even layer. 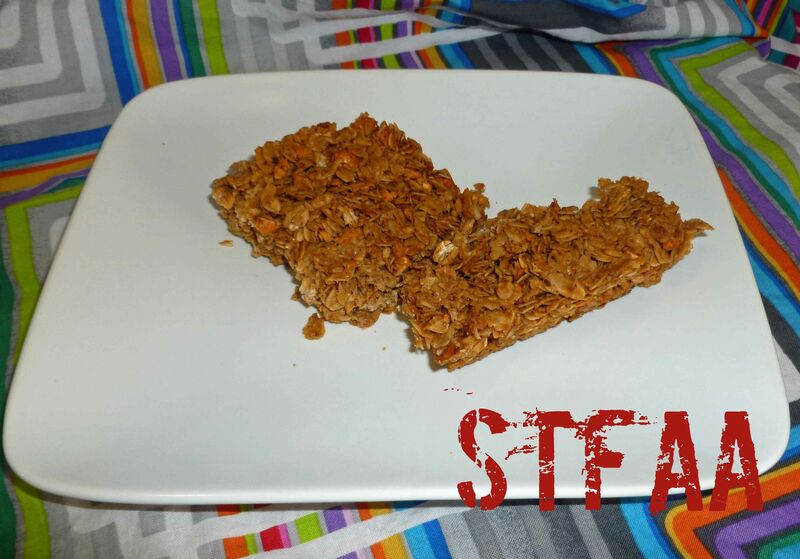 Use a large metal spatula sprayed with safe for you oil and press the mixture into the baking sheet. Make sure your later is thin, flat and very tightly pressed together. Bake until golden about 40 minutes. Remove the baking sheet from the oven, and place it on a wire rack for about 10 minutes. Cut the bars using a metal spatula or a bread dough cutter/scraper, making sure you cut all the way through. Do not wait to cut the bars, or they won't cut. Don't remove the cut bars from the baking sheet until they cool all the way.